Congress was very busy in 2010 creating new tax laws. Are there any tax breaks for writers? I’m happy to report some good news. All workers and self-employed business owners, such as freelance writers, will get a 2% raise thanks to our Uncle Sam for 2011. Congress decided to stimulate the economy by getting Americans to spend more money. They have done it before with checks in the mail, but this year they will do it by reducing the Social Security tax from 6.2% to 4.2%, but only for 2011. I’ll discuss the new tax bills, how they may affect freelance writers, authors and publishers. If you’re not a member and you’d like to join in time for the teleclass, you may click on the Join NAIWE” link below to do so. If you would like to register for the teleclass only, you may do so by visiting the Teleclass page. We hope you’ll join us! Hop on over to the home page of TaxesForWriters.com to receive that handout from the show. Look in the bottom right corner for my report: New Tax Laws in 2010. Anything for Writers? New tax laws. Anything for writers? 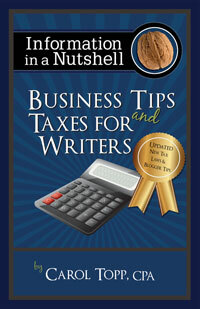 Business Tips and Taxes for Writers book coming soon!